Quadrese Glass '19, Janaiya Banks '19 and Naji Thompson '19 pose in front of the special-interest house they co-founded. Five students are living in X House this semester. Photo by Carl Socolow ’77. As students return to campus for the start of the 2018-19 academic year, they’ll discover a new special-interest house on Louther Street. 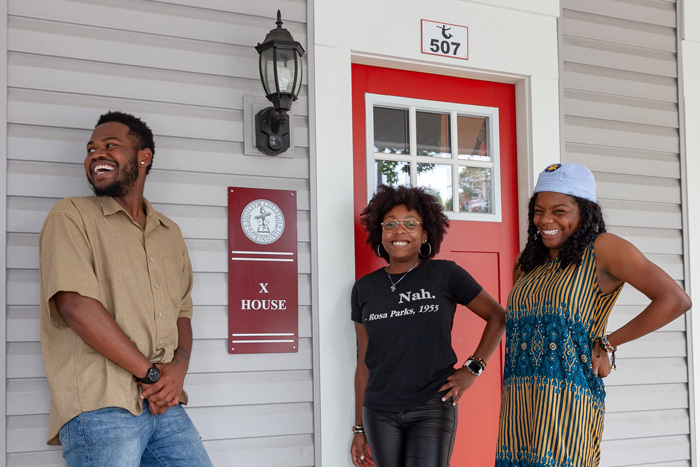 Founded last year by three students in the class of 2019, X House provides a dedicated space for students to learn about, celebrate and cultivate black culture. At the close of the fall 2017 semester, Banks, Glass and Thompson drafted a petition to found a new house dedicated to African American culture and, with help from the 2017-18 Black Student Union executive board, they collected signatures in support of their plans. They submitted a formal proposal to Dickinson's administration just weeks later. In February, it was official: X House would be established at 507 West Louther Street in time for the following fall. Banks and Thompson are among X House’s first residents, along with fellow class of ’19 members John Adeniran (computer science, neuroscience), Ginnah Etah (sociology) and Christian Moton (sociology). Their first project is a Homecoming & Family Weekend barbecue and open house, which will include a dedication ceremony in remembrance of Legacy Watkins ’18. X House also announces the establishment of a Martin Luther King Jr. Memorial Library, similar to the black-history library once housed in the Strayer basement. “This library would serve as a hub of information detailing the history, struggles, triumphs and, most important, the accomplishments of black scholars, athletes, musicians, activists,” says Banks, “along with any other materials that can help aid us in cultivating a healthy pride in our history and ourselves.” Anyone who wishes to donate materials is encouraged to drop them off during the Saturday, Sept. 22 open house, 4-7 p.m., or send them to: Dickinson College c/o X House, 28 N. College Street, Carlisle, PA 17013. Campus-community members who wish to drop off library donations at X House can do so by appointment; please email xhouse@dickinson.edu to arrange a date and time.